This product was added to our database on Monday 3 October 2016. 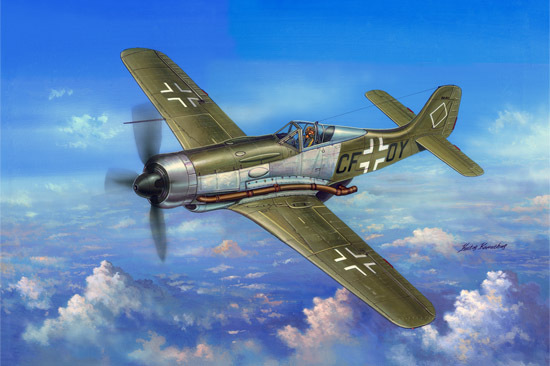 The FW 190 V18 was designed and built as a prototype for the high-altitude FW 190 C, and in V18/U1 form it had the DB 603 A engine driving a four-bladed propeller. The FW 190 C was a projected high-altitude fighter that never came to fruition; even so five prototypes were completed, the FW 190 V18, V29, V30, V32 and V33. Each of these aircraft had DB 603 inline engines, annular radiators, Hirth 9-2281 turbochargers and four-bladed propellers. By 1944 the project had been halted by technical problems and opposition to use of the DB 603 (which was needed for other aircraft types).